About Reading Reality – Escape Reality, Read Fiction! Reading Reality is a consultancy that specializes in ebook integration and other collection development and technical services related solutions for libraries. Ongoing ebook collection development, including ebook only publications. Reading Reality isn’t just about ebook collections. Physical collections are still an essential part of serving patron needs. Training and workshops on collection development and management. Providing a detailed rules analysis of local cataloging practices to make the exceptions more efficient and less expensive. Providing a detailed processing analysis to determine where steps can be reduced to save the library time and money with shelf-ready and library-staff processing time. Supplying your library with workflow analysis for cataloging and processing so that those labor-intensive processes can be cost-effectively converted into shelf-ready processing with any materials vendor. Reading Reality also offers frequently updated content for your library’s website. Reviews of genre fiction, particularly fantasy, science fiction and romance. Book and popular culture related essays. Work on topics of local interest can be arranged upon request. Content samples located at Escape Reality, Read Fiction. Marlene Harris, the founder of Reading Reality, has been a solutions-oriented manager of technical services operations in all types and sizes of libraries, from the Chicago Public Library to the University of Alaska Anchorage. She has extensive experience with managing outsourcing technical services operations at both Chicago Public Library and the Alachua County Library District (FL). 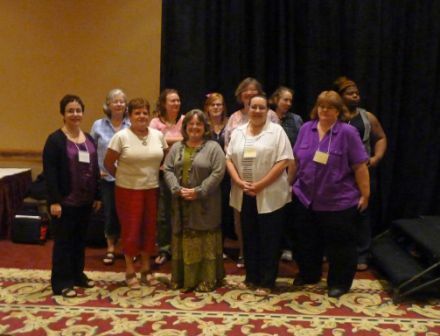 Reading Reality’s well-received workshop on “The Brave New World of Genre Fiction Selection” has been presented in person at the South Carolina Collection Development Mini-Conference and as a webinar for the Maryland Library Association. The picture at left is from a three-day workshop on Collection Development and Acquisitions at the State Library of Missouri’s 2011 Summer Institute. She also participated in a panel discussion at the American Library Association Annual Conference in New Orleans on the topic Leading Technical Services in 2011. Reading Reality is available for workshops, speaking engagements or customized solutions for your library’s needs. Contact them at marlene@readingreality.net for further information.